Looking back on my photos from Albania, it's hard to believe they were all taken in the same, small country. The terrain changed so drastically from city to city in Albania, that each day was like seeing a different place all together. As we boarded the tiny ferry for our three hour ride to Valbona, I felt like I was back on the Norwegian Fjords. Giant, grass-covered mountains towered above either side of the bright blue lake. The sun was warm on my skin, so I gave up my seat on the top deck and crawled instead out on the gangway by the abandoned cars, as close to the water as I could get to have an un-obstructed view. I was also blasting the Frozen soundtrack and singing along, and out here no one could hear me. When we arrived in Valbona, it looked more like Switzerland. Alpine architecture, red-and-white checked tablecloths, sky-high evergreens! I took a deep breath, and then another, and another; there are few feels as satisfying as the freshness of the mountain air filling your lungs. Especially for a city-dweller. The driveway to our hotel was less of a path and more of a grassy field, where we dodged boulders like bumper cars and passed horses, goats, and sheep until we arrived at a beautiful wooden cabin five stories tall. I wanted to braid my hair, change into lederhosen, and start yodeling! This little hotel was a family-run gem; the nicest accommodation in the area and dripping in cute and authenticity - recommended by my tour company, Limitless Albania. We spent the afternoon driving around taking in the beautiful nature and having a Northern-style farm-to-table meal; trout from the lake, homemade cheese from the goats. 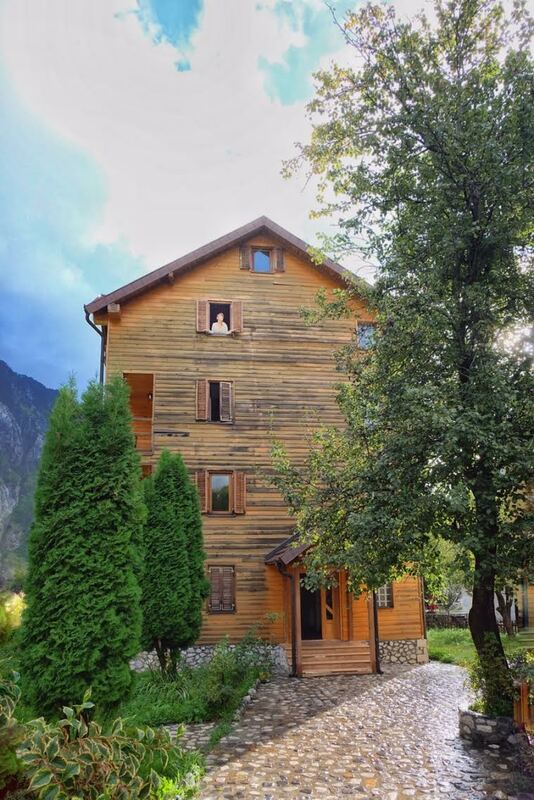 In Valbona you can hike, or ride horses, or cozy up by the fire with some mountain tea. We did a little of each before the clouds rolled in; and then we dozed off to the sound of the rain for an alpine afternoon nap. We woke up to find that the rain had caused a power outage; as apparently it often does. It was only seven at night but midnight black outside - the sky illuminated only by a thousand, glittering stars! Suddenly I was back in Africa, on the Sergeneti where no light pollution makes for the most magical star-gazing. There was no telling when, or if, the power would be back on; so the restaurant would be serving dinner by candlelit only. Like the evening needed a way to become more charming. Darkness makes everything more serene, calm, and quite. Everyone in the restaurant was reduced to just a glow face; lit only by the soft light from the waning candle in the middle of each table. Voices, reduced to whispers served as the only background music. There, in the mountains, we had an northern farm-to-table dinner of fresh trout, homemade goat cheese, fresh-baked bread, boiled potatoes, and generous pours of wine. For dessert? A buttery, apple tart with fresh currants and and a sugary crumble, served a la mode, as all things should be. I drifted to sleep that night; my belly and heart both enormously full of the magic of Valbona.